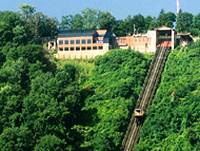 The Johnstown PA Incline Plane is listed in The Guinness Book of Records as The Worlds Steepest Vehicular. Enjoy a breathtaking view from the city from the observation deck. 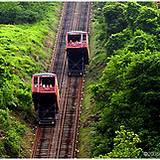 The Incline cars carry passengers and their cars up and down a 71.9% grade hillside measuring 900 feet from the river valley below. 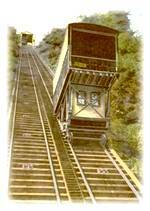 The Cambria Iron Company began construction of this unique incline railway in 1890. The true vision for this railway was to carry people, horses and wagons to the hilltop community of Westmont. 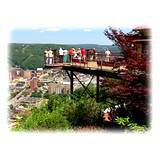 On June 1, 1891, the Johnstown Incline Plane began carrying its passengers up steep Yoder Hill. 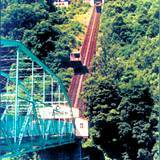 During the construction of this incline railway the engineers had no idea they were actually building a means of escape for thousands of Johnstown, PA residents during the historic Johnstown Floods. On March 1, 1936 when floodwater ran through Johnstown the Incline Plane proved its worth by carrying 4000 residents to safety. During the most recent flood to hit Johnstown on July 20, 1977, the Incline Plane once again carried people to higher ground. It also provided transportation to emergency vehicles, personnel and equipment, along with boats to aid in the rescue operations. While you're in the Johnstown area why not visit other attractions? Trace the fascinating history of the immigrants that has made Johnstown PA what it is today at the Heritage Discover Center Museum. Here you'll interact with the immigrant of your choice and learn the history of the region. A great time to visit the Incline Plane would be the third weekend in June, this is when you can attend the famous Thunder in the Valley Annual Event. You'll see over 160,000 bikers invade downtown Johnstown and the Allegheny Mountains. The design of the Johnstown Incline Plane is considered to be simple. It's a balanced incline plane with a double track, each with an eight-foot gauge. The two cars a permanently attached to steel cables, counterbalancing each while in operation. As one care rises the other is lowered. Power is only needed to lift the net weight. In the lobby of the Johnstown PA Incline Plane Visitors Center there is a large window from which you can view the motors and machinery that control the Incline Plane. There is another observation area outside the Incline Station Restaurant and Pub. 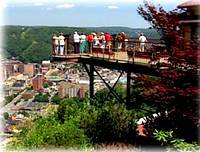 The observation deck provides an extensive view of the Johnstown Region. Directly in front of the observation deck you can see a view of the gap in the valley. This is where the 1889 floodwaters emerged following the path of the Little Conemaugh River. The 25-foot wall of water crossed directly in front smashing into Yoder Hill, then backwashed to the south up the path of Stoney Creek, then came back, down river, jamming at the Old Stone Bridge. The Old Stone Bridge still stands today, just south of Point Stadium. The Point is where Stoney Creek, which is right below the Johnstown Incline Plane observation deck, and the Little Conemaugh River, which is across the valley east of Johnstown, PA, join to form the Conemaugh River. The Conemaugh flows in a northwesterly direction, eventually joining the Kiskiminitis and then on to the Allegheny River north of Pittsburgh at Freeport. Ice Cream and Gift Shop! Directly behind the Incline Plane is the James Wolfe Sculpture Trail, the first trail of this kind in the United States. Mr. Wolfe, and nationally known sculpture, was commissioned to create eight steel sculptures from remnants produced by the local Bethlehem Steel plant. His premier piece is a 40-foot sculpture situated directly below the Incline observation deck entitled, "Triumph of the Spirit". You can enter the trial through the special doorway and staircase at the Conductor's booth at the base of the Incline. The sculptures are at the left. 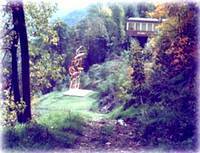 There is a hiking trail at the right of the sculptures. This trail is at the front slope of Yoder Hill and will bring you to the top of the Incline Plane. At the top of the Johnstown PA Incline Plane you will find a beautiful gift shop and an ice cream stand. Here you can buy snacks and souvenirs. 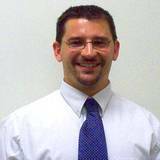 Physical Therapy & Sports Rehab, P.C.